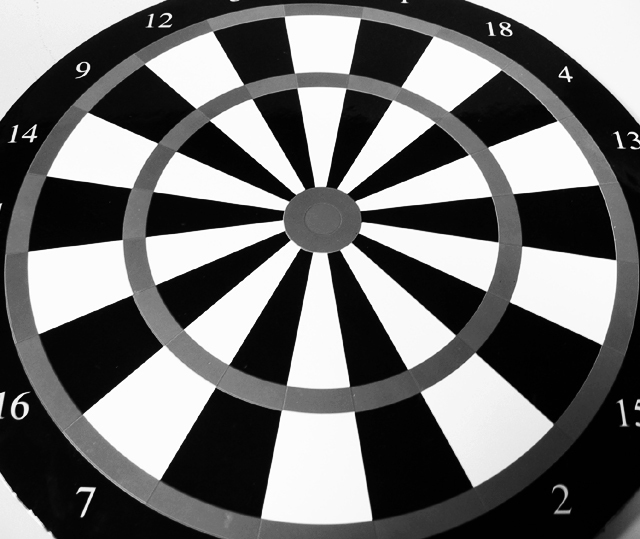 a magnetic dartboard shot using the B&W mode on my camera and plain flourescent lighting. Hi Mark. A very symmetrical and well thought out image, good idea. The decision to go black and white worked. The DOF is deep, everything fully in focus, the detail is fantastic. What strikes me first when I look at this photo is the amazing contrast. The blacks and whites are so subtle! The composition is good, the angle works here. I think a straight on shot wouldn't have had as much impact. The only thing I would have changed is the crop. Everything in this photo is so symmetrical except for the crop which you can see on the outer ring of the dartboard. I would have cropped it more evenly. Beautiful....Nice symmetry, it is very intoxicating and eye pleasing. I like the black and white. I like the idea but feel that the processing is too extreme. I realise it was probably a deliberate effect but I would have preferred something more natural. This is almost hypnotic. Or one of those pictures that you can stare at for 30 second then close your eyes and still see it. Try staring at the middle for some time and concentrate... Your pic comes to live! Pretty good shot. Needs to be rotated to the left a little. Cropping and angle of the shot is great. I would have cropped a hair more off the top so that your border was on the gray area as it is on the bottom. I like the light and dark contrast. Proudly hosted by Sargasso Networks. Current Server Time: 04/23/2019 09:54:20 AM EDT.